From employees to taxpayers and citizens to college officials, the view seems to be that reflected in Sheheen’s conclusion: LOAD DOWN THE WAGONS; TO HELL WITH THE MULES. While this quote is in reference to situations that occurred while Sheheen was Commissioner of Higher Education for South Carolina, that attitude is still prevalent. For months, Camden has been embroiled in a conflict situation about city administrators using taxpayers’ money to construct a YMCA when the city already has recreational facilities that seem to be working just fine. I don’t pretend to understand the politics and practicalities of it. I just know that it was/is a major deal that has people writing and signing petitions and that the powers-that-be appear to be insulted/annoyed/shocked that the citizens dare to question them. As much as I enjoyed the article and appreciate Sheheen’s clear, crisp writing and the enlightenment it provided, I have to admit that his conclusion packed the most powerful punch of all. It was so perfect, in fact, that I found myself laughing aloud. Why? Because it speaks to much of how things are managed and how people are viewed. What do you think? 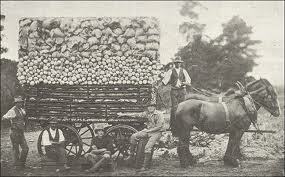 Do you see examples of loading down the wagons with little regard for the mules? Can/will you share an example?